The increasing focus on mental health across the globe calls for guidance on how mental disorders manifest across different cultures and suggests the best practice models for addressing these issues from a cultural context. Additionally, in countries with limited resources and increased susceptibility to natural disasters, the call is even more urgent. In addition to poverty and limited resources, low- and middle-income countries (LMICs) are most vulnerable to disasters, which make the need for culturally sensitive and sustainable mental health programs even greater. This monograph provides a framework for how to address mental health issues internationally in collaboration with local partners to create sustainable programs. Specifically, this monograph provides didactic and practical examples using a mental health-training program that has been implemented in Haiti for the past 20 years. Successes and challenges, as well as lessons learned and recommendations for other practitioners and researchers, are provided. This monograph is a guidebook focusing on how to implement mental health training programs internationally. 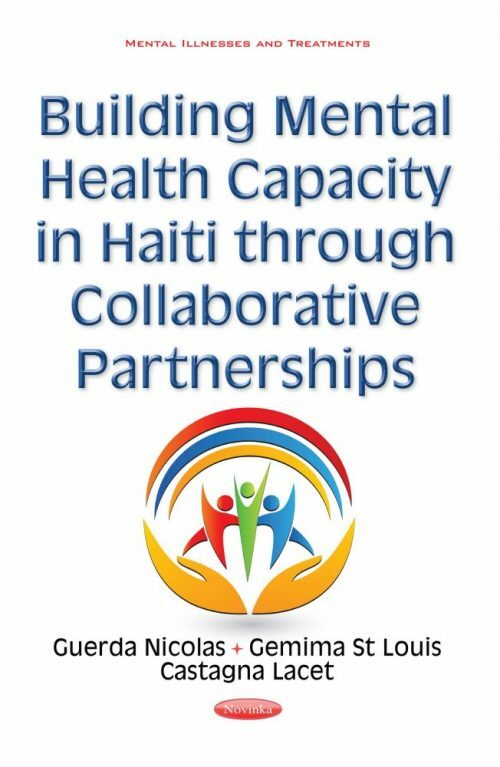 The authors’ aim is to structure the book in a way that will use Haiti as an example of what scholars who are interested in global mental health can do to effectively implement a training program internationally. This monograph includes didactic as well as detailed practical examples with illustrations of the mental health training program in Haiti for the past two decades. The monograph highlights the guiding principles that we have used as a framework for the authors’ research. They are: (1) In-Country Partnership, (2) Enhancing Cultural Knowledge, (3) Building a Culturally Competent Team, (4) Creating a Culturally Relevant Curriculum, and (5) Building Capacity. The authors’ show the reader how to use the framework and approaches with any subject and country. Barr, A., Marcel, F., & Trudy, O (2005). “The Governance of Non-Governmental Organizations in Uganda.” World Development, 33(4), 657-79, April. Doku, V.C.K., Wusu-Taky, A., & Awakame, J. (2012). Implementing the mental health act in Ghana: Any challenges ahead? Ghana Medical Journal, 46, 241-250. Hansmann, Henry. 1980. “The Role of Nonprofit Enterprise.” The Yale Law Journal, 89, no. 5 (April). Lund, C., DeSilva, M., Plagerson, S., Cooper, S., et al. (2011). Poverty and mental disorders: Breaking the cycle in low-income and middle-income countries. Lancet, 378 (9801), 1502-1514. Patel, V., & Kleinman, A. (2003). Poverty and common mental disorders in developing countries. Bulletin of the World Health Organization, 81(8), 609-615. Patel, V., Kirkwood, B. R., Pednekar, S., Weiss, H. & Mabey, D. 2006. Risk factors for common mental disorders in women. Population-based longitudinal study. British Journal of Psychiatry, 189, 547-55. Roberts, M., Mogan, C., & Asare, J.B. (2014) An overview of Ghana’s mental health system: results from an assessment using the world health organization’s assessment instrument for mental health systems (WHO-AIMS). International Journal of Mental Health System, 8 (16). doi:10.1186/1752-4458-8-16. Saraceno B, van Ommeren M, Batniji R, Cohen A, Gureje O, Mahoney J, Sridhar D, Underhill C (2007) Barriers to improvement of mental health services in low-income and middle-income countries. Lancet, 370, 1164–1174. doi:10.1016/S0140-6736(07)61263-X. Saraceno B., Van Ommeren M., Batniji R., Cohen A., Gureje O., Mahoney J. (2007). Barriers to improvement of mental health services in low-income and middle-income countries. Lancet, 370, 1164–1174. Schuller, M. (2012). Killing with Kindness: Haiti, International Aid, and NGOs. New Brunswick, NJ: Rutgers University Press, xvi+233 pp. Sipsma H, Ofori-Atta A, Canavan M, Osei-Akoto I, Udry C, Bradley EH (2013) Poor mental health in Ghana: who is at risk? BMC Public Health, 13 (288). doi:10.1186/1471-2458-13-288. Wang, P.S., Berglund, P.A., Olfson, M., et al. (2004). Delays in initial treatment contact after first onset of a mental disorder. Health Service Research, 39, 393–415. World Health Organization (2010a). Mental health and development: targeting people with mental health conditions as a vulnerable group, Geneva, WHO Press. health settings. http://www.who.int/mental_health/publications/mhGAP_ intervention_guide/en/. Accessed 6 Jun 2015. World Health Organization (2011) WHO-AIMS report on mental health system in Ghana. http://www.who.int/mental_health/who_aims_country_ reports/ghana_who_aims_report.pdf?ua=1. Accessed January 2015. Albee, G. W. (1996). Revolutions and counterrevolutions in prevention. American Psychologist, 51(11), 1130-1133. Colin, J. M., & Paperwalla, G. (1996). Haitians. In J. G. Lipson, S. L. Dibble, & P. A. Minarik (Eds. ), Culture and nursing care: A pocket guide (pp. 139-154). San Francisco, CA: University of California, San Francisco Nursing Press. Cowen, E. (1991). Cowen, E. (1994). The enhancement of psychological wellness: Challenges and opportunities. American Journal of Community Psychology, 22, 149-179. Cowen, E. L. (1996). The ontogenesis of primary prevention: Lengthy strides and stubbed toes. American Journal of Community Psychology, 24,235-249. Dunst, C. J., Trivette, C. M., & Thompson, R. (1990). Supporting and strengthening family functioning: Toward a congruence between principles and practice. Prevention in the Human Services, 9(1), 19-43. Epp, H.T. 1988. Way of the migrant herds: Dual dispersion strategy among bison. Plains Anthropologist 33:309-20. Miller, N. L. (2000). Haitian ethnomedical systems and biomedical practitioners: Directions for clinicians. Journal of Transcultural Nursing, 11, 204-11. Munoz, R. E., Mrazek, P. J., & Haggerty, R. J. (1996). Institute of Medicine report on prevention of mental disorders: Summary and commentary. American Psychologist, 51, 1116-1122. Nicolas, G., Arntz, D., Hirsch, B., & Schmiedigen, A. (2009). Cultural adaptation of a group treatment for Haitian American adolescents. Professional Psychology: Research and Practice, 40(4), 378–384. Nicolas, G., DeSilva, A. M., & Grey, K. S., & Gonzalez-Eastep, D. (2006). Using a multicultural lens to understand illnesses among Haitians living in America. Professional Psychology: Research and Practice, 37(6), 702-707. Nicolas, G., DeSilva, A. M., Houlahan, S., & Beltrame, C. (2009). Culturally authentic scaling approach: A multi-step method for culturally adapting measures for use with ethnic minority and immigrant youths. Journal of Youth Development, 4(1), 81-95. Pan American Health Organization (PAHO), Health in the Americas (2007). Washington, DC: PAHO, 2007, 425- 744 pp. Prilleltensky, I. (1994). The morals and politics of psychological discourse and the status quo. Albany, NY: University of New York Press. Rickel, A. U., & Becker, E. (1997). Keeping children from harm’s way: How national policy affects psychological development. Washington, DC: American Psychological Association. Trickett, P.K., Allen, L., Schellenbach, C.J. and Zigler, E.F. (1998) Integrating and Advancing the Knowledge Base About Violence Against Children: Implications for Intervention and Prevention. In P.K. Trickett and C.J. Schellenbach (Eds.) Violence Against Children in the Family and the Community (pp 419-437) Washington, DC: American Psychological Association. Tucker CM, Herman KC, Ferdinand LA, Beato C, Adams D, Cooper L. (2007). Providing culturally sensitive healthcare: A formative model. The Counseling Psychologist, 35:679–705. doi: 10.1177/0011000007301689. Watters, E. (2010). Crazy like us: The globalization of the American psyche. New York, NY: Free Press. World Health Organization and UNICEF (1978). Primary Health Care: Report of the International Conference on Primary Health Care. Alma-Ata USSR. 6–12 September, 1978. Geneva: WHO. Anderson, F., Donkor, P., de Vries, R., Appiah-Denkyira, E., Dakpallah, G. F., Rominski, S., … Ayettey, S. (2014). Creating a charter of collaboration for international university partnerships: The Elmina Declaration for Human Resources for Health. Academic Medicine: Journal of the Association of American Medical Colleges, 89(8), 1125-1132.
community engagement. Retrieved from http://www.atsdr.cdc.gov/ community engagement/. Centers for Disease Control and Prevention. (1999). Framework for program evaluation in public health. MMWR, 48(No. RR-11). Retrieved from http://www.cdc.gov/mmwr/pdf/rr/rr4811.pdf. and Human Services, NIH Publication No. 11-7782. Retrieved from http://www.atsdr.cdc.gov/communityengagement/pdf/PCE_Report_508_FINAL.pdf. Connell, C. M., Holmes, S. B., Voelkl, J. E., & Bazaar, H. R. (2002). Providing dementia outreach education to rural communities: Lessons learned from a train-the-trainer program. Journal of Applied Gerontology, 21(3), 294–313. Howze, E. H., Auld, M. E., Woodhouse, L. D., Gershick, J., & Livingood, W. C. (2009). Building health promotion capacity in developing countries: Strategies from 60 years of experience in the United States. Health Education & Behavior, 36, 464–475. Kutcher, S., Chehil, S., Cash, C., & Millar, J. (2005). A competencies-based mental health training model for health professionals in low and middle income countries. World Psychiatry, 4(3), 177-180. Lund, C., De Silva, M., Plagerson, S., Cooper, S., Chisholm, D., Jishnu, D., ... Patel, V. (2011). Poverty and mental disorders: Breaking the cycle in low-income and middle-income countries. The Lancet, 378(9801), 1502-1514. Lund, C., Breen, A., Flisher, A., Kakuma, R., Corrigall, J., Joska, J., ... Patel, V. (2010). Poverty and common mental disorders in low and middle income countries: A systematic review. Social Science & Medicine, 71(3), 517-528. Milstein, B., & Wetherall, S. (2000). A framework featuring steps and standards for program evaluation. Health Promotion Practice, 1(3), 221-228. Murray, L. K., Dorsey, S., Bolton, P., Jordans, M. J. D., Rahman, A., Bass, J., & Verdeli, H. (2011). Building capacity in mental health interventions in low resource countries: An apprenticeship model for training local providers. International Journal of Mental Health Systems, 5(30), 1-12. Office of Migrant Education. (2001). Comprehensive needs assessment. Retrieved from http://www2.ed.gov/admins/lead/account/compneed sassessment.pdf. Orfaly, R. A., Frances, J. C., Campbell, P., Whittemore, B., Joly, B., & Koh, H. (2005). Train-the-trainer as an educational model in public health preparedness. Journal of Public Health Management and Practice, S123–S127. Palmer-Wackerly, A. L., Krok, J. L., Dailey, P. M., Kight, L., & Krieger, J. L. (2014). Community engagement as a process and an outcome of developing culturally grounded health communication interventions: An example from the DECIDE Project. American Journal of Community Psychology, 53, 261-274. Rossi, P., Lipsey, M., & Freeman, H. (1999). Evaluation: A systematic approach (6th ed.). Thousand Oaks, CA: Sage. Roussos, S. T., & Fawcett, S. B. (2000). A review of collaborative partnerships as a strategy for improving community health. Annual Review of Public Health, 21, 369–402. Saraceno, B., van Ommeren, M., Batniji, R., Cohen, A., Gureje, O., Mahoney, J., … Underhill, C. (2007). Barriers to improvement of mental health services in low-income and middle-income countries. Lancet, 370, 1164-1174. Shore, N. (2006). Re-conceptualizing the Belmont Report: A community-based participatory research perspective. Journal of Community Practice, 14(4), 5-26. Stuart, R. B. (2004). Twelve practical suggestions for achieving multicultural competence. Professional Psychology: Research & Practice, 35(1), 3-9. Sue, D. W., Arredondo, P., & McDavis, R. J. (1992). Multicultural counseling competencies and standards: A call to the profession. Journal of Counseling & Development, 70(4), 477-486. Sue, D. W., & Sue, D. (2012). Counseling the culturally diverse: Theory and practice (6th ed.). New York, NY: John Wiley & Sons. Taveras, S., Duncan, T., Gentry, D., Gilliam, A., Kimbrough, I., & Minaya, J. (2007). The evolution of the CDC HIV prevention capacity-building assistance initiative. Journal of Public Health Management and Practice (Suppl. ), S8-15. Tobias, C. R., Downes, A., Eddens, S., & Ruiz, J. (2012). Building blocks for peer success: Lessons learned from a train-the-trainer program. AIDS Patient Care and STDs, 26(1), 53-59. Trickett, E. J., Beehler, S., Deutsch, C., Green, L. W., Hawe, P., McLeroy, K., et al. (2011). Advancing the science of community-level interventions. American Journal of Public Health, 101(8), 1410–1419. doi:10.2105/ AJPH.2010.300113. University of Kansas Work Group for Community Health and Development. (2015). Community assessment, agenda setting, and choice of broad strategies. Lawrence, KS: Community Tool Box. Retrieved from http://ctb.ku.edu/en/table-of-contents. Wallerstein, N. (2002). Empowerment to reduce health disparities. Scandinavian Journal of Public Health Supplement, 59, 72-77. World Health Organization. (2001). The world health report 2001 – Mental health: New understanding, new hope. Retrieved from http://www. who.int/whr/2001/media_centre/press_release/en/. World Health Organization. (2011). Global burden of mental disorders and the need for a comprehensive, coordinated response from health and social sectors at the country level. Geneva, Switzerland: World Health Organization. Ng, C., Fraser, J., Goding, M., Paroissien, D., and Ryan, B. (2013). Partnerships for community mental health in the Aisia-Pacific: Principles and best-practice models across different sectors. Australasian Psychiatry 21 (1), 38-45. Ogilvie, L., Allen, M., Laryea, J., Opare, M. (2003). Building capacity through a collaborative international nursing project. Journal of Nursing Scholarship, 35 (2), 113-118. Sider, S. (2014). School leadership across borders: Examining a Canadian-Haitian partnership to support educational capacity-building in Haiti. International Studies in Educational Administration 42 (1), 75-88. Zeng, X., Hinshaw, A., Yu, M., Guo, G., and Oakley, D. (2001). Building international partnerships. International Nursing Review, 48, 117-121. George, E., & Meadows-Oliver, M. (2013). Searching for collaboration in international nursing partnerships: A literature review. International Nursing Review, 60(1), 31-36. Hudson, C., & Vissing, Y. (2013). Sustainability at the edge of chaos: Its limits and possibilities in public health. Biomed Research International. http://dx.doi.org/10.1155/2013/801614. Leffers, J., & Mitchell, E. (2010). Conceptual model for partnership and sustainability in global health. Public Health Nursing. 28(1), 91–102. Burt, M. R., Harrell, A. V., Newmark, L. C., Aron, L. Y., & Jacobs, L. K. (1997). Evaluation guidebook: Projects funded by S.T.O.P. formula grants under the Violence Against Women Act. Washington, DC: The Urban Institute. Centers for Disease Control and Prevention. (1999). Framework for program evaluation in public health. MMWR Recommendations and Reports, 48(RR11), 1-40. Chalk, R., & King, P. A. (Eds.). (1998). Violence in families: Assessing prevention and treatment programs. Washington DC: National Academy Press. Coyle, S. L., Boruch, R. F., & Turner, C. F. (Eds.). (1991). Evaluating AIDS prevention programs: Expanded edition. Washington DC: National Academy Press. Donaldson, S., Christie, C., Mark, M. (eds), 2009, What counts as credible evidence in applied research and evaluation practice?, Sage Publications, California. Green, L.W., & Kreuter, M. W. (1991). Health promotion planning: An educational and environmental approach (2nd ed.). Mountain View, CA: Mayfield Publishing Company. National Committee for Injury Prevention and Control. (1989). Injury prevention: Meeting the challenge. American Journal of Preventive Medicine, 5(Suppl. 3). Nutbeam, D., Bauman, A., 2011, Evaluation in a nutshell: a practical guide to the evaluation of health promotion programs, McGraw Hill, North Ryde. Rossi, P. H., & Freeman, H. E. (1993). Evaluation: A systematic approach (5th ed.). Newbury Park, CA: Sage Publications, Inc.
Short, L., Hennessy, M., & Campbell, J. (1996). Tracking the work. In M. Witmer (Ed. ), Family violence: Building a coordinated community response: A guide for communities. Washington, DC: American Medical Association. W.K. Kellogg Foundation. (2004). W.K. Kellogg evaluation handbook. Retrieved from: https://www.wkkf.org/resource-directory/resource/2010/ w-k-kellogg-foundation-evaluation-handbook. Fitzpatrick, J. L., Sanders, J. R., & Worthen, B. R. (2011). Program evaluation: Alternative approaches and practical guidelines (4th Ed.). Upper Saddle River, NJ: Pearson Education, Inc.
Hepner, P. P., Warmpold, B. E., Owen, J., Mindi, T. N., & Wang, K. T. (2015). Research design in counseling (4th Ed.). Boston, MA: Cengage Learning, Inc.
Yarbrough, D. B., Shulha, L. M., Hopson, R. K., & Caruthers, F. A. (2011). The program evaluation standards: A guide for evaluators and evaluation users (3rd ed.). Thousand Oaks, CA: Sage.